volunteers. These workshops are open to anyone who’s been touched by Ovarian Cancer whether it be a survivor, caregiver, family member or friend. There are call-in or video options for those who cannot make our workshops in person or those who do not live close by. 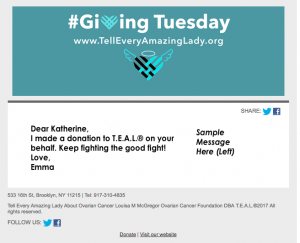 Definition of a T.E.A.L.® Ovarian Cancer Survivor: is an “Amazing Lady” who at any time in her life has been diagnosed with Ovarian Cancer whether she is currently a patient in treatment or cancer free. It could have been yesterday or 50 years ago. We honor these “Amazing Ladies” in a variety of events and programs including invitations to participate in our T.E.A.L.® Survivor Ceremony during our Annual T.E.A.L.® Walk/Run program in cities across the US. We offer free programs and services for survivors and their families all year long. As an Ovarian Cancer Survivor, T.E.A.L.® workshops have given me tools to cope with the stresses of diagnosis and the warmth of a community. T.E.A.L.® has now made attending a workshop globally accessible. If you are unable to attend a workshop at the T.E.A.L.® Community Center, you can still participate online through workshop webinars from the comfort of your home. If you are interested in joining a workshop through a webinar please e-mail rsvp@tealwalk.org and mention “webinar” so that we send you the webinar invitation. T.E.A.L.® is also offering a new phone in option and video conferences. Let us know what works for you! In 2015, T.E.A.L.® opened the T.E.A.L.® Community Center in Brooklyn to host awareness and education programs for survivors, their families, and the general public to educate and enhance the quality of life for the local community. We pride ourselves in being the only Ovarian Cancer Community Center in the country offering support to those who need, both in person and virtually. You might even see some special four-legged guests when you stop in our Community Center.